Hey everyone! Dr. D-Flo here. In case you stumbled upon my page via a search engine, I am a huge 3D printer enthusiast. I have 3D printed well over 100 kilos worth of knickknacks and prototypes. I even 3D printed a 3D printer. This post will only include 3D printers that I have laid my hands on, so there is a chance I have not experienced the ultimate 3D printer (unlikely). This roundup will only include fused deposition modeling (FDM). This will come as no surprise to my YouTube viewers, but the MakerGear M3 takes the crown for the best overall 3D printer. The M3 adds increased connectivity, auto bed leveling and the option of independent dual extruders over its M2 predecessor (my current printer). The independent dual extruders doubles the productivity of this printer, allowing the user to simultaneously print two separate parts or speed up the print time of multi-material parts. Increasing speed without decreasing quality is always preferable. It's a fact: 3D printers will break. When 3D printers go down or need to be re-calibrated the quicker you can get your printer up and running the less frustrated you will be. MakerGear has implemented tidy wire management that does impede the ability to switch out an extruder, fan, or heated build platform. In addition, MakerGear offers a no questions asked one year warranty, which I can vouch for. There is a reason the MakerGear has been labeled as a workhorse because it prints and prints without problems. For homeowners and parents, the idea of a 3D printer extruding molten filament is often associated with fires. The M3 offers connectivity that allows you to monitor the printer wherever internet access is available. The most likely source of a 3D printer catching fire is surprisingly not the hot end but instead a poor connection to or crappy component on the motherboard. MakerGear mitigates these concerns by using quality components. If you have never heard of the MakerGear M3 you may be thinking: "Hey this is a hidden gem!" Similar to a gem, the M3 carries a hefty price tag with the single extruder model costing $2,350 and the independent dual extruder variant costing $3,000. After hearing that price tag you may need more convincing. I print a kilogram of filament a week, and it has been months since I have had to do any sort of repair or calibration of my M2. If you are serious about 3D printing and want consistent, fast, and high quality prints I recommend the MakerGear M3. The new trend of 3D printing is multi-material parts and soluble supports. These prints cannot be done on a single extruder. Therefore, for the best value printer I have chosen the FlashForge Creator Pro, a dual extrusion printer costing $899. Dual extrusion is a difficult task for a 3D printer and requires more engineering than simply strapping a second extruder to the print head. A sturdy frame and near perfect linear motion is needed so that the printer can accurately switch between extruders. While there are cheaper printers that exist claiming dual extrusion they often cut too many corners to allow for consistent prints. FlashForge's aluminum case and dual bearing z-axis creates a stiff environment for clean prints. With handles on both side, the Creator Pro's form factor allows the printer to be moved easily without fear of damage. My old workplace ordered 10 Creator Pros and they all arrived in working condition, which was aided by the protective design. By adding a small acrylic "hat" to the printer the build space can be enclosed, which is preferable when prints with ABS filament. The enclosure also muffles the whine of the stepper motors. The main downside of the Creator pro is its reliability and serviceability. I was in charge of keeping the aforementioned 10 creator pros running, and a common problem was a jammed extruder. Inside of the extruder assembly was a nylon tube that helped guide the filament to the nozzle. This nylon tube could deform or become clogged, and while easily to replace, it was a problem that occurred a frustrating amount of times (keep in mind I was working with 10 printers). If an extruder failed both extruders would have to be replaced because the two extruders were connected. Replacing a fan or any component on the print head required undoing all of the Creator Pro's wire management. Even though the FlashForge Creator Pro has these issues it is one of the few 3D printers surrounded by an awesome community. If you want a 3D printer that does not break the bank and won't keep you from experiencing the multi-material revolution I recommend the Creator Pro. You may argue that spending $700 is way too much to be classified as a budget printer. However, I am hard-pressed to find any printer under $750 that I would ever use or even give away as a gift. All printers under this price make huge sacrifices on either the build volume, extruder, warranty or electrical components. 3D printing is an addictive hobby, and you do not want to buy a sub $500 3D printer just to have to buy another one down the road due to inadequacies. One way to get a quality 3D printer for less is by sourcing the parts and building it. The Prusa i3 kit saves you $200 over the assembled printer. If you have the patience and time building your 3D printer will give you a deeper understanding of its inner workings and allow you to better troubleshoot future problems. It takes about 5 hours for assembly. The online community has an obsession with Prusia i3, especially r/3Dprinting, and for good reason. Every part of the Prusa i3 is open source even down to the Marlin firmware, making this printer an ever-evolving project. I find the open source community to be much more responsive and helpful than talking to a company's technical support. The Prusia i3 produces some of the best prints out of any 3D printer on the market, beating out printers over $2000. The secret to its flawless prints is a full mesh bed auto leveling system. An un-leveled bed can have deleterious effects on your print, including poor first layer adhesion. Manually perfecting the leveling of a bed is time consuming and a bit awkward. The leveling system of the Prusia can compensate for warps in the heated bed and slopes. It amazes me how this technology is absent from many prosumer 3D printers. The main drawback of the Prusia i3 is its single extruder. For such a great printer its single extruder is a real let down. To address this problem, the Prusia team has designed an upgrade ($300) to be released shortly that will allow 4 different spools of material to feed into a single extruder. Their approach seemingly overcomes many of the issues associated with multi-material printing with dual extruders (info here), but I still have my doubts about this approach. It will take a long time to purge the nozzle when switching colors, and it is not clear which 3D printer programs will make this feature available. While the assembly can be a little daunting, the Prusa i3 is a great first printer with a print quality that far surpasses its cost. For reasons mentioned in the TOP BUDGET PRINTER category very cheap (<$400) printers will not be mentioned because either they will catch fire, drive you crazy, or are missing features that will quickly make you buy a new printer. 3D printing is still far from a budget friendly hobby. Building your own 3D printer is a more affordable option. This printer just missed out on being the top budget printer, and it even comes assembled at a similar price point to the Prusia i3 kit. With a slightly unusual but appealing cantilevered print arm, the Simple Pro makes 3D printing look more elegant than it really is. Overall, the frame is sturdy even with the extruder assembly jutting out. The auto-leveling bed allows for a uniform first layer crucial to successful prints. The bed size is a little constrictive at 150 x 150 x 150 mm, but an upgrade to 250 x 250 x 150 mm is available. The main problems with this machine are not with the design but with quality control and customer service. First, Printrbot only offers a 60 day warranty, which is very little time to discover any defects. I recommend running this printer continuously from day 1. Unfortunately, if you do have an issue with your printer Printrbot's customer service is lackluster and slow. I included the Amazon link because it is easier to make returns that way. Finally, their included 3D printer software, Printrbot.cloud, is garbage, but this is not a huge issue because there are many free alternatives available. Simplify3D is my favorite 3D printer software. A couple of years ago the Simple Pro used to be the most popular 3D printer under <$750. However, recently it has fallen from grace. If you are willing to roll the dice you may end up a great 3D printer or a quality control nightmare. This printer is number 1 on my list because generally quality control is an issue at this price point, and I enjoyed my experience with the Simple Pro. 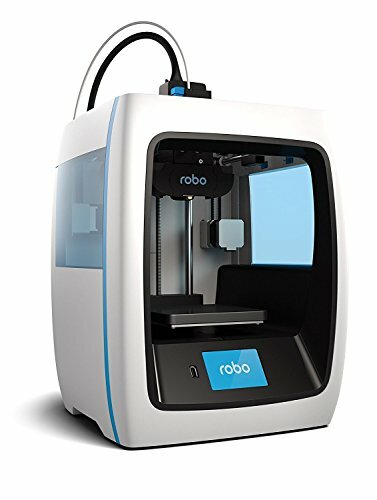 If you have been reading sequentially you will notice that the Robo C2 is the first 3D printer listed to look like a toy. The white body with blue accents adds a little fashion to this printer. At this price point, fashion comes at a cost. We will discuss this more later. The Robo C2 is what I would describe as a family printer. The filament run out detection and automatic bed leveling keeps 3D printing simple. The printer uses Octoprint to allow the user to control the printer on an app or through a browser. Octoprint is the wireless connectivity standard for 3D printing, so Robo C2 can be controlled by more apps than just the native one. I appreciate Robo's use of non-proprietary software (in case the company ever goes under). The Robo C2's encased sides keep the printer's noise levels to a whisper. This was a very quiet printer. So what was lost for the modern appearance? Build Volume, heated plate, and build material! When I first saw this printer I thought it was weird that all the sides were enclosed except the front because if it had a door it would be able to print ABS like a pro. However, this printer lacks a heated plate, which means ABS cannot adhere to it. People like to claim that PLA sticks just fine without a heated build material, which may be true for objects with large bases but is certainly not for every other type of filament. Personally, I find the presence of a heated bed a nonnegotiable specification because even PLA adheres better with a little bit of heat. The actual build platform is made out of an indiscernible plastic that I would assume could be melted with by the nozzle if the two ever come into contact. The Robo C2 has a lot of flaws in my eyes, but it takes the number 2 spot because it is aimed at the family and not the enthusiast, and it has plenty of features to keep the kids and parents busy. Please take this broad recommendation lightly because I would be remiss if I did not notify/warn you of 3D printer clones. Many 3D printers like the Prusa i3 are open source and part of the RepRap community, where the inventors make all designs freely available. Some companies then take these plans and build copies or "clones" using the cheapest parts. The printers are remarkably inexpensive ranging from $200 to $500. Once you receive a clone you are generally on your own with very little if any technical support. These printers often arrived damaged because a company paying the least amount for components is definitely not going to pay for comprehensive packaging. Even if you are ordering a clone off of Amazon it still had to be shipped from the manufacturer to one of Amazon's warehouses. It will be your responsibility to return it or find a new part, which requires experience. If you are looking up top 10 3D printers and reading a post like this unfortunately you are probably in your early phases of learning about 3D printers, so I would stay clear of clones. While a clone could save you a lot of money, it could also burn your house down. One option is using the mechanical components from a clone and sourcing your own electrical components to make sure the wiring and power supply are up to code. Pictured in this section is the CR-10, a Prusa clone that has been experiencing a lot of hype recently. In the near future, I will make a top clones list for the experienced tinkerer. This a tricky price range to navigate because some companies increase the price of their 3D printers to make people think they are more premium. If a printer is lacking a heated plate or has a build volume under 150 x 150 x 150 mm then this is a red flag. 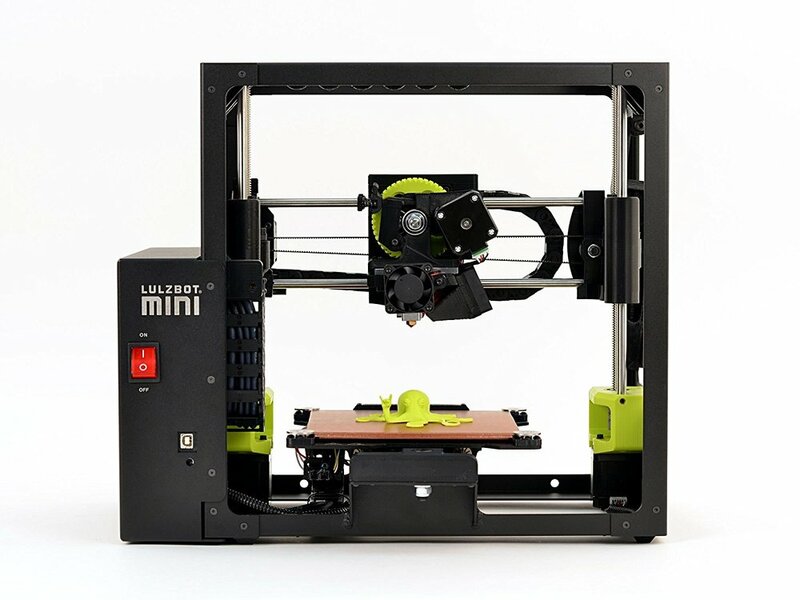 The LulzBot Mini is the perfect 3D printer for a beginner. It is better engineered than all other competition at its price point. Here is an example: for auto bed leveling other 3D printers are using inductive proximity switch to locate the bed, but in this setup the z distance difference between the nozzle and switch must remain constant. Bumping the inductive switch will completely throw off the printer's ability to level. LulzBot did away with the inductive switch and used the extruder tip as the probe, simplifying the print head. When the nozzle touches each washer in the four corners of the build platform it will notify the computer that the distance is close to zero. Sorry for geeking out about that, but it was a good way to show how thoughtful the designers were. The LulzBot also includes a nozzle cleaners, which is a nice touch to prevent a bead of filament from ruining the first layer. Lulzbot has a great track record for customer support. The reason I do not own the LulzBot Mini even after my raving review is because of its small build platform and single extruder. You need to look at your needs. A lot of my prototypes require larger printer volumes and specialized support material, but I live on the fringe of 3D printing. The LulzBot Mini is fully capable of creating the average DIYer's dreams. 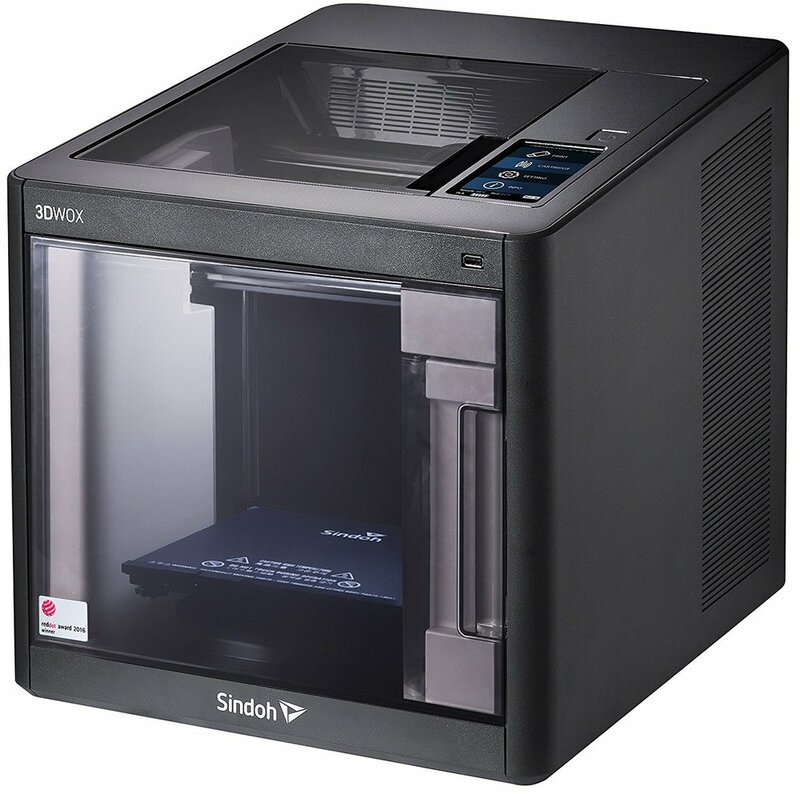 Sindoh 3DWOX DP200 printer has all the bells and whistles. All it needs is a more marketable name! I kid. The DP200 features wireless connectivity, a webcam to monitor prints from afar, a fully enclosed work space and something we have not seen before real time filament monitoring. With the hole in the middle of the filament spool it can be difficult to judge if you have enough filament to finish a print. Other printers can notify you when you are out of filament, but the DP200 was one of the first printers to know exactly how much filament is on the spool at any time. The DP200 is able to accomplish this feat through a proprietary cartridge. Replacing filament on this printer is reminiscent of changing cartridge on an inkjet. Proprietary usually means expensive, and Sindoh's cartridges are no exception. Fortunately, Sindoh made it possible to just buy a refill for the cartridge for a much more reasonable price, but having to refill the cartridges takes away from the original simplicity of the design. Sindoh has bundled the perfect technology to complement 3D printing, but have they gone too far with the filament cartridges? I think it is a quirk that some people will appreciate. The D300VS is the first and only Delta printer to make the roundup at any price point. Unlike many Cartesian printers (any other printer on this list) Deltas move only the print head through three arms that independently move up and down the vertical axis. Each arm acts as a hypotenuse of a triangle and because the arm length never changes movement in the vertical axis will cause a change in the coordinate plane. Restricting movement only to the print head keeps the build platform still, promoting bed adhesion. The D300VS checks all the boxes. It has a sturdy frame, tried and tested E3D V6 hot end, massive build volume, and wireless connectivity. Unlike its competitors, the spool feeds directly into the extruder, which sidesteps the need for long runs of filament guide tube. This increases the responsiveness of the hot end's ability to extrude and retract. The D300VS unbeatable price point is a result of the printer being sold as a kit. This kit requires more technical skills than a beginner may be comfortable with. Soldering and wiring crimping are needed for full assembly. A full days work should be expected to erect this 3D printer. The D300VS will probably be the next 3D printer that I own. Its tall cylindrical build volume is perfect for a lot of niche projects I have in mind. Its third place ranking was a result of its overwhelming assembly requirements. At this price point the 3D printer has to be capable of multi-material extrusion to make the list. There are just too many single extruder models capable of production level quality below this price point. Do not forget that the MakerGear M3 would fall under this category. Independent dual extruders are the preferable way to deliver multiple materials. People love the Lulzbot Taz 6. The vibrant 3D printed extruder gear just seems to draw you in. My only gripe about this beautiful machine is that there is no way to directly purchase a Taz 6 pre-configured with dual extruders. 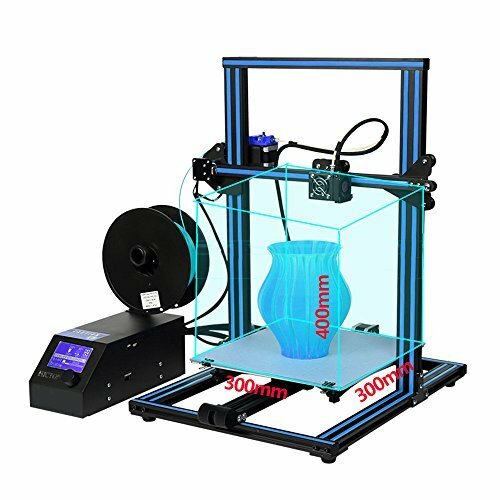 You have to buy the Taz 6 with a single extruder ($2500) and then the upgrade kit ($500). Presumably, a direct purchase of a dual extruder Taz 6 would save the customer a couple of hours and a hundred dollars. With a max hot end temperature of 300 degrees Celsius, the Taz 6 can handle nearly any exotic filament (except carbon fiber). The build platform has the same auto leveling feature of the LulzBot Mini and is remarkably rigid. The build platform is only responsible for one degree of freedom, lessening the vibration on the printed part. With a build area of 280 mm x 280 mm x 250 mm, the Taz 6 has the largest coordinate plane build area featured in this lineup. Once upgraded to the dual extruder, any print is feasible on the Taz 6. At $3,000 its a hard decision to choose the Taz 6 or the Makergear M3. Both printers are exceptional. At this price point a little style will not result in any trade offs. BCN3D's Sigma R2017 features an aggressive design with LED mood lighting creating a futuristic appearance. The Sigma looks about as much as it cost ($3200). After turning the printer on the user is met with an intuitive calibration process including auto bed leveling. The printer will extrude a couple of lines, and you select which layer height looks appropriate. The sleek touch screen is a warm welcome over the cheap LCD screens and plastic knobs that so many other printers use. When printing in multi-materials, the independent dual extruders stay out of each other's ways preventing color and material contamination. There was no need for an ooze shield that could fall into the print. The extruders each have a small waste bin to purge their nozzles before printing. This waste bin keeps the bottom of the printer free from scraps. With all of Sigma's futuristic features you may wonder if it was released too soon after witnessing the print quality. While the print quality is definitely acceptable the small hoops and blemishes are uncharacteristic of a printer costing over $3000. The bed experiencing a large unsupported overhand and poor calibration of the two extruders could be at fault. Fortunately, the Sigma is completely open source with all the files located conveniently online, so adjustments can be made. Sigma also regularly releases firmware updates that should help tune the printer. The next iteration of this printer will give the M3 a run for its money. Please note that any links to Amazon are Dr. D-Flo's affiliate links. If you make a purchase using one of these links Dr. D-Flo will receive a monetary kick back. This is how he pays for his website. Thanks for your support!